This Layered Coconut Chocolate Cheesecake is super indulgent, and easier to make than you might think! Making cheesecake always makes me nervous, but its one of my most favorite desserts. I’ve yet to reach a point where I feel like I have perfected my cheesecake baking abilities. 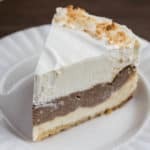 This recipe for Layered Coconut Chocolate Cheesecake was my first attempt to make a layered cheesecake. And, I messed it up, more than once! But, I also realized that as much as I thought I was messing it up, I really wasn’t! Without thinking, I put the lighter coconut layer on the bottom, rather than the thicker chocolate layer. I baked it anyway because I didn’t have enough cream cheese to make a whole new cheesecake. I figured I would still know if I had the flavors right, and then I could remake it another time. Then, I thought I had over-baked it and ended up with some cracks. I think baking a cheesecake without cracks is like fine art. Not everyone can do it. I was already planning to add a homemade whipped cream layer, and that covered any cracks. But, I still had to cut into this thing and was terrified it would be a disaster. Shockingly, it wasn’t. It was baked perfectly and the texture was consistent throughout! The lines between the layers aren’t as perfect as I was hoping, but the taste…amazing! And that is the reason I’m sharing this somewhat imperfect cheesecake recipe with you anyway! I do plan to remake it with the cheesecake layers reversed, but I have a ridiculous amount of cheesecake in my freezer and I don’t think I can justify adding more at the moment! These instructions are how I made the Layered Coconut Chocolate Cheesecake pictured in this post. While I would recommend putting the chocolate layer on the bottom instead, I have yet to test it. When I do, I will update the photos and instructions. You will need to set your cream cheese out ahead of time so that it can come to room temperature before you begin. Have all your other ingredients out and ready to go before you start. 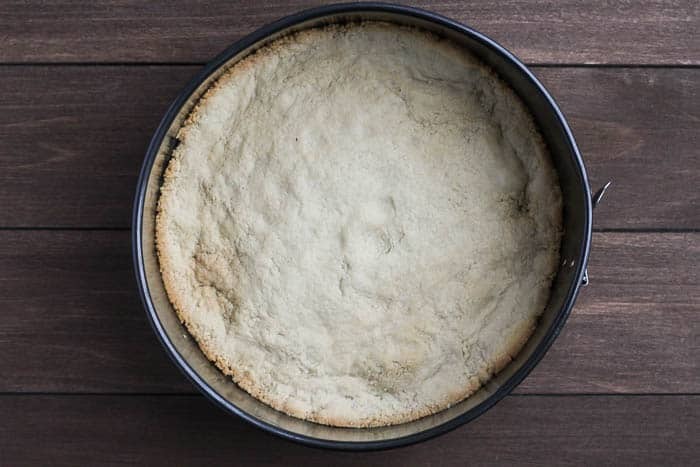 To make the Almond Crust, add the almond flour, sugar, and melted butter to a food processor. Pulse until everything is moist. Press the crust into the bottom and up the sides some of a 9″ springform pan. Bake the crust for 8-10 minutes, until the edges just start to brown. Set aside to cool. Lower the heat on the oven to 325°F. 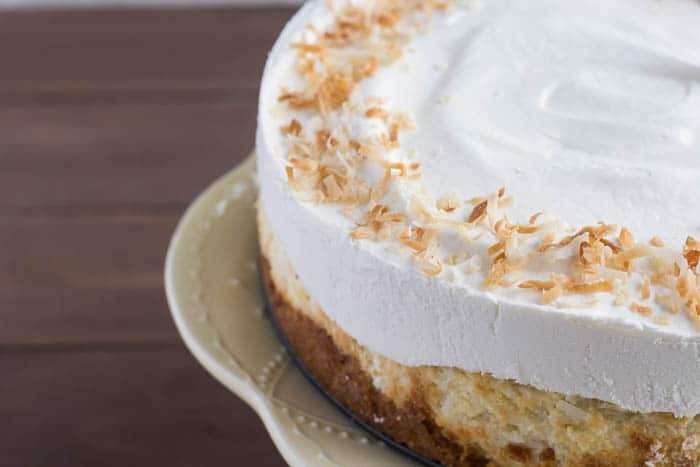 For the Coconut Cheesecake layer, beat the cream cheese and sugar in the bowl of an electric mixer on low-medium. Add the eggs one at a time, then the cream of coconut, vanilla extract, and shredded coconut. Pour over the cooled Almond Crust. Wash the mixing bowl and return it to the mixer. 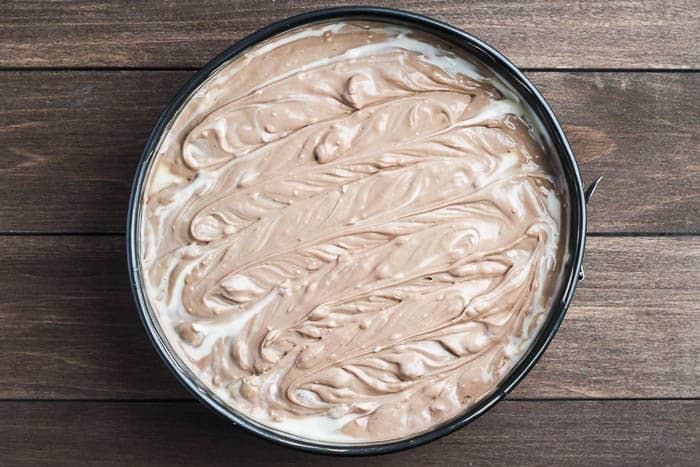 To make the Chocolate Cheesecake layer, add the cream cheese and sugar to the bowl of an electric mixer and beat on low-medium speed until fluffy. Add the eggs one at a time, then the vanilla and melted chocolate chips. Pour over the Coconut Cheesecake layer and spread to the edges of the pan. Bake for 45-60 minutes. The cheesecake will get puffy and still be jiggly in the center. It will come down and firm up as it cools. 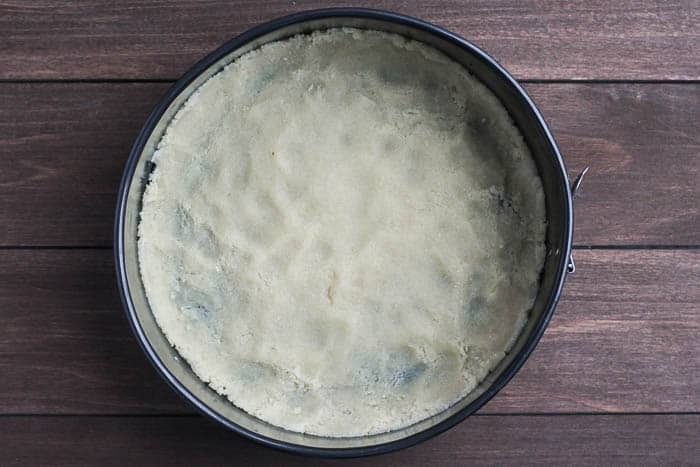 Chill the cheesecake in the refrigerator for 4 hours. Make the whipped cream by adding the heavy cream, sugar, and vanilla to bowl of an electric mixer. Beat on medium speed until soft peaks form. Spread the whipped cream over the Chocolate Cheesecake layer. Top with additional toasted coconut, if desired. You can buy toasted coconut or simply make your own! 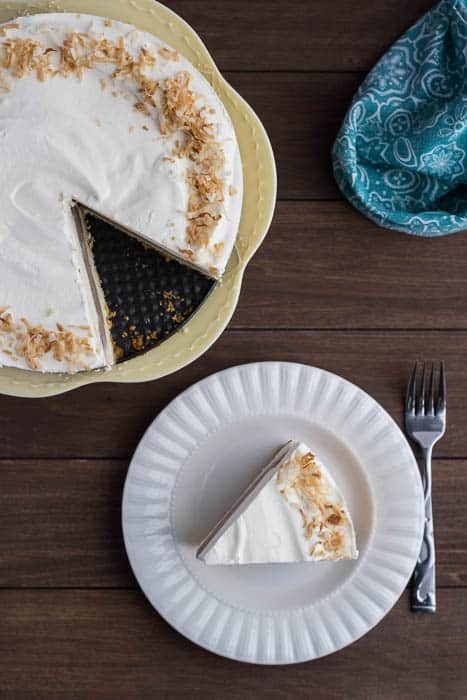 Use a pretty cake stand and plates to make this Layered Coconut Chocolate Cheesecake look even more special! Keep in the refrigerator until you are ready to serve it. PREP: You will need to set your cream cheese out ahead of time so that it can come to room temperature before you begin. Add the almond flour, sugar, and melted butter to a food processor. Pulse until everything is moist. Press the crust into the bottom and up the sides some of a 9″ spring form pan. Bake the crust for 8-10 minutes, until the edges just start to brown. Set aside to cool. Lower the heat on the oven to 325°F. 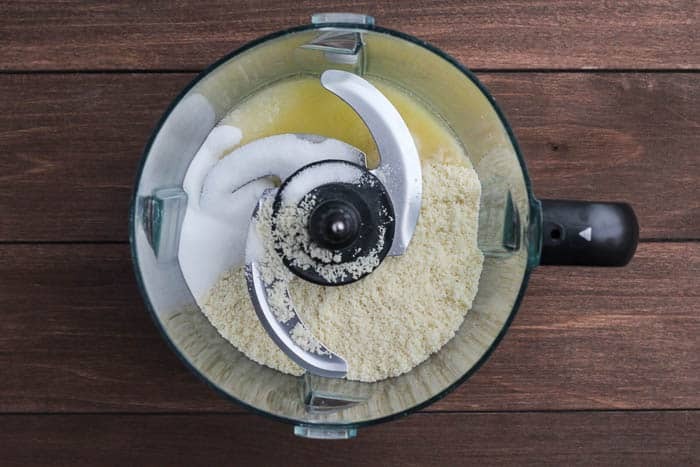 Beat the cream cheese and sugar in the bowl of an electric mixer. Add the eggs one at a time, then the cream of coconut, vanilla extract, and shredded coconut. Pour over the cooled Almond Crust. Melt the chocolate chips in a double boiler or microwave (I usually do 30 second intervals for 1 minute, stirring in between, then 15 second intervals, stirring in between until it's smooth). Set aside. Add the cream cheese and sugar to the bowl of an electric mixer and beat on low speed until fluffy. Add the eggs one at a time, then the vanilla and melted chocolate chips. Pour over the Coconut Cheesecake layer and spread to the edges of the pan. These instructions are how I made the Layered Coconut Chocolate Cheesecake pictured in this post. While I would recommend putting the thicker chocolate layer on the bottom instead, I have yet to test it. When I do, I will update the photos and instructions. 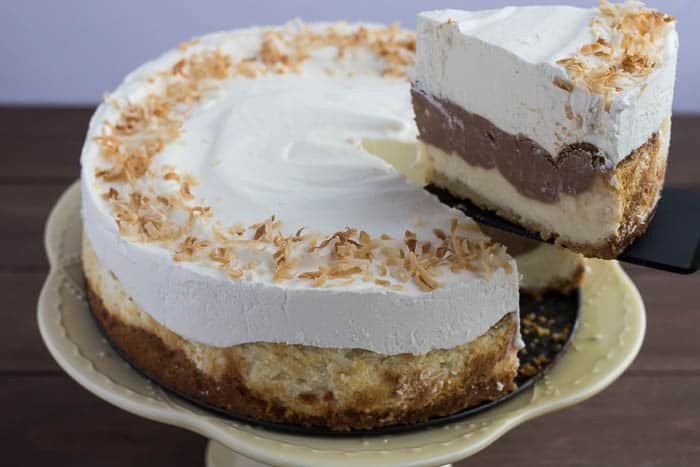 This coconut chocolate cheesecake looks divine! And so simple, even I could make it and I’m not a baker by any means. Those layers look divine and the flavor combo sounds incredible! Yum! Coconut and cheesecake? I’m in love, this recipe looks divine! This cheesecake in no way looks imperfect to me. Thanks for sharing it despite it not being “perfect” as most I what I bake won’t be either. Love the idea for the almond crust. Yum! OMG….obsessed with coconut and this was just what I was looking for.